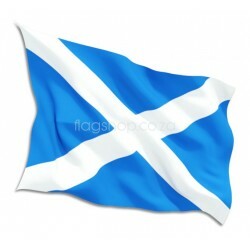 The Flag of Scotland, (Scottish Gaelic: Bratach nàiseanta na h-Alba, Scots: Banner o Scotland), also known as Saint Andrew’s Cross or the Saltire, is the national flag of Scotland. 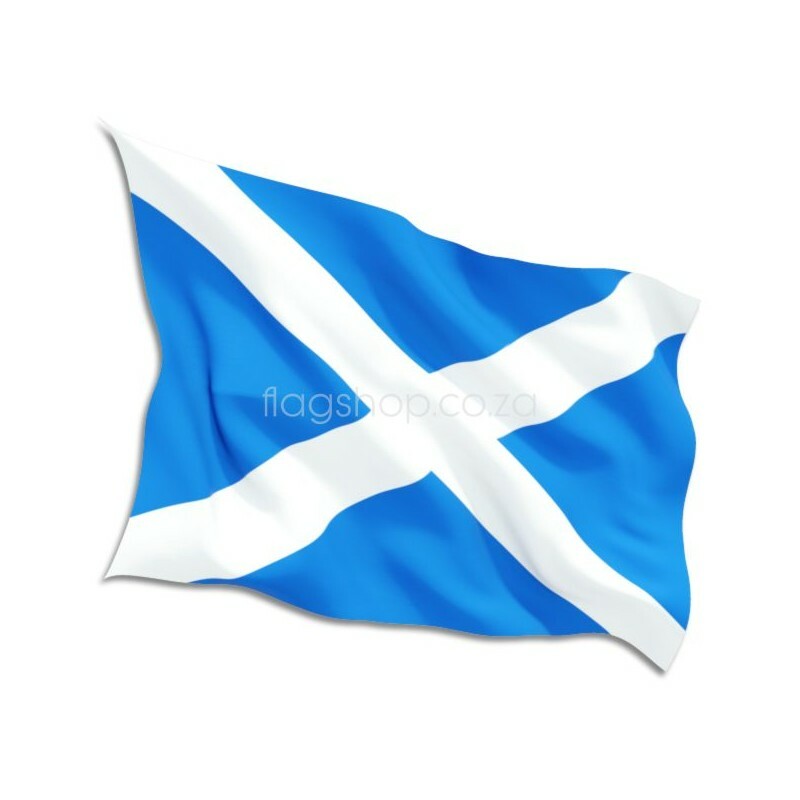 As the national Flag of Scotland, it is the Saltire, rather than the Royal Standard of Scotland, which is the correct flag for all individuals and corporate bodies to fly in order to demonstrate both their loyalty and Scottish nationality. It is also, where possible, flown from Scottish Government buildings every day from 8am until sunset, with certain exceptions. According to legend, the Christian apostle and martyr Saint Andrew, the patron saint of Scotland, was crucified on an X-shaped cross at Patras, (Patrae), in Achaea. Use of the familiar iconography of his martyrdom, showing the apostle bound to an X-shaped cross, first appears in the Kingdom of Scotland in 1180 during the reign of William I. This image was again depicted on seals used during the late 13th century; including on one particular example used by the Guardians of Scotland, dated 1286. Use of a simplified symbol associated with Saint Andrew which does not depict his image, namely the saltire, or crux decussata, (from the Latin crux, ‘cross’, and decussis, ‘having the shape of the Roman numeral X’), has its origins in the late 14th century; the Parliament of Scotland having decreed in 1385 that Scottish soldiers shall wear a white Saint Andrew’s Cross on their person, both in front and behind, for the purpose of identification. The earliest reference to the Saint Andrew’s Cross as a flag is to be found in the Vienna Book of Hours, circa 1503, where a white saltire is depicted with a red background. In the case of Scotland, use of a blue background for the Saint Andrew’s Cross is said to date from at least the 15th century, with the first certain illustration of a flag depicting such appearing in Sir David Lyndsay of the Mount’s Register of Scottish Arms, circa 1542.